Looking for the best free movie apps for mobile phones? If yes then you at the perfectly right place. Well it is a fact that almost everybody loves watching movies. Their tastes may be different as some prefer comedy while others like action or romance or drama or horror movies. Over the time Smartphones has become very powerful and now you can even watch and download movies on your Smartphone whether it is an Android, iPhone or Windows Phone. You can also book movie tickets, watch movie trailers, get movie reviews & ratings and get all the information about the latest movie releases on your smartphones and tablets using the various available best movie apps. 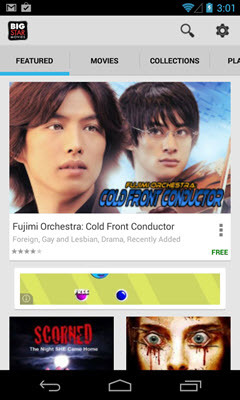 There are tons of mobile movies apps available on Google Play, Apple Store and Windows Store. But you should be very careful in choosing the movie apps as all of them are not good and some of them can even harm your smartphone by infecting it with malware or slows it down considerably and can also prove to be a battery hog. So here in this post I am going to list down the best free movie apps for Android, iOS and Windows Phone. Earlier in this blog I have also covered the best music downloader apps but here I am going to provide you the best free movie apps for your mobile phones or tablets. These below mentioned movie apps are free & safe to use, download and are very popular among the users. Here are the best handpicked free movie apps that every movie lover should have on their smartphone or tablet. These free movie apps are completely legal to use, download and for watching or streaming movies online for free. Most of these below mentioned movie apps are for Android and iOS devices as very few of them are available for Windows Phone. There is rarely any movie lover who does not know about IMDb website. IMDb or Internet Movie Database is a massive online database that contains information related to movies, TV and video games. It is also available as an app for mobile phones for various platforms including Android, iOS and Amazon apps. IMDb is owned by Amazon and is one of the most popular websites or movie apps for movies and tv shows. It is unarguably the must have app for movie lovers. On IMDb you can get all the information on movies, tv shows and celebrities. You can watch movie trailers, read movie reviews, rate movies & tv shows, get latest information on upcoming movies, view movies and celebrities photos and view latest news on movies, television and celebrities. IMDb is available in various languages that include English (US/UK), Spanish, German, French, Portuguese, Italian, Japanese, Korean, and Chinese. 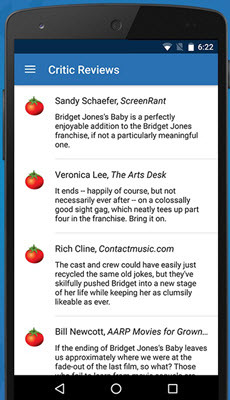 IMDb is a free movie app and you can download it for your Android and iOS smartphone. Tubi TV is another popular and one of the best free movie apps around. Using this movie app you can watch free popular movies and tv shows on your mobile phone in full HD quality. You don’t to subscribe or pay a single penny to watch movie or TV shows on Tubi TV. Every week new movies and TV shows are added to the Tubi TV database. This movie app also support Chromecast / Airplay and you can watch movies on bigger screen i.e. LCD TV etc. You can also watch and resume the movie from where you have left off. The various movie genres include drama, comedy, action, romance, horror, animation, Korean movies and much more. This online movie streaming app is completely legal to use and download on your smartphone or tablet. Tubi TV is available for Android, iOS and as Google Chrome Extension. Netflix is the one of the most downloaded and popular movie apps in the world. Netflix is the leading subscription service for watching movies and TV shows. Netflix movie app is free to download but for watching movies and TV you have to subscribe to its plans. Netflix offers 1 month free membership for its first time users and during that one month you can watch unlimited films and TV programmes. 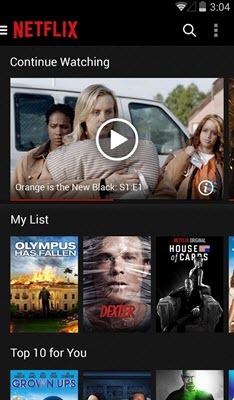 Netflix mobile movie app is available for free to download for Android, iOS and Windows Phone. Flixster is one of the most downloaded movie apps of all time. It is a free movie app where you can watch movies trailers, get Rotten Tomatoes scores and buy movie tickets with Fandango. You can browse the whole movie database or latest movies and read their reviews and also rate them. You can save the favorite theaters and local theaters by name or distance, and discover & bookmark the new upcoming movies. The countries supported by flixster app are US, UK, Canada, and Australia. 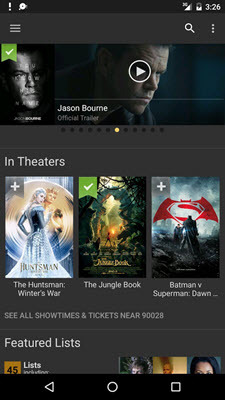 Flixster movie app is available for Android, iOS and Windows Phone. Crackle is another free movie app on which you can watch free TV and movies anytime. This movie app supports many devices that include Roku, Apple TV, PlayStation, Xbox and more. You watch full movies and TV shows completely free as no subscription or authentication is needed. You can also watch Crackle original programs that include Jerry Seinfeld’s Comedians in Cars Getting Coffee, Joe Dirt 2, Sports Jeopardy, SuperMansion and more. 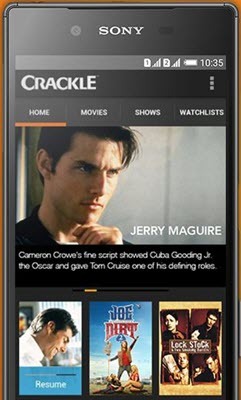 Crackle movie app is available for Android, iOS, Blackberry and Windows Phone. Viewster is one of best free movie apps for smartphones and tablets. 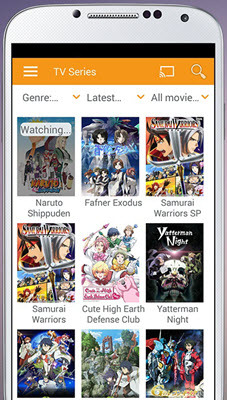 On this movie app you can watch free movies, TV shows and Anime instantly. You can also watch Viewster original movies and TV shows for free. 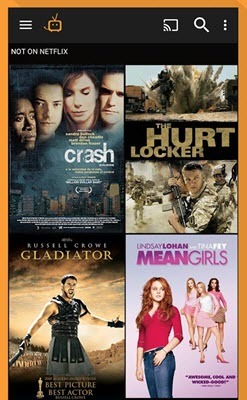 New movies are uploaded weekly on viewster. This free movie app supports Chromecast and is available for android and apple devices on app store or iTunes. JustWatch is not a movie streaming app but it is a movie search engine app to find the available online movie streaming services where you can watch movies and TV shows legally online. This movie discovery app list offers from Netflix, Amazon Prime Video, Now TV, ITV, BBC iPlayer, iTunes, XBOX, Playstation, Wuaki, Blinkbox, Chili and Mubi in the United Kingdom. JustWatch movie app is also available in Canada, the US, Australia, New Zealand, Brasil and Germany. You can also create a watchlist and filter movies on the basis of genre from various streaming providers. JustWatch is free to download and is available for Android and iOS for iPhone, iPad etc. Popcornflix is another one of the most popular free movie apps available online. Popcornflix is the premium app for watching free movies on your mobile phone or tablet. This movie app is completely free to use and new films are added daily for viewing online. The various movie genres include Comedy, Romance, Family/Kids, Drama, Urban, Action/Thrillers, Horror, Espanol, Documentaries, Bollywood and many more. Popcornflix is available for Android, iOS and Blackberry mobile devices. BoxTV is a free movie app and free movies download app that has huge collection of movies and TV shows. On BoxTV you can watch and download Hindi, English, Tamil, Telugu, Punjabi, Bengali, Malayalam & Marathi movies and TV shows for free. You can also subscribe to BoxTV premium service to unlock some of the best movies and tv shows available online. 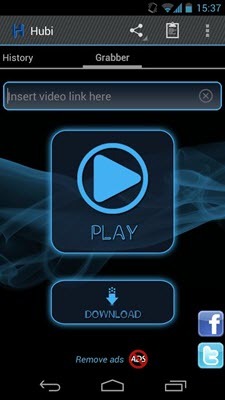 This movie app also include search and resume playback functionality which comes in very handy. The movies and TV shows on BoxTV is available in different video quality based on your mobile internet speed. BoxTV is available for Android, iOS and Windows Phone for free. BIGSTAR is one of a kind free movie app that includes award winning independent movies, foreign films, documentaries, film festival winners, shorts and more. You watch movies for free on this app. This app is not for people looking for Hollywood movies. Bigstar movie app supports various devices including iPhone, iPad, Roku, Android TV, PopBox, Palm WebOS, Yahoo Widget, Android, Samsung TV, Vizio TV, Sony TV etc. This movie app is to find movies and TV shows on various available online streaming services that include Netflix, Hulu Plus, Amazon Prime, Xfinity, DirecTV, HBO GO, HBO NOW, Google Play, Crackle, MTV, CBS, Vudu, FOX, CW, PBS, Lifetime, YouTube, A&E, History Channel, MAX GO, Showtime, Cartoon Network, Comedy Central, VH1, ABC, Starz, EPIX and Fandango. Yidio Premium offers first 7 days free service and after that you will have to pay the subscription fee. 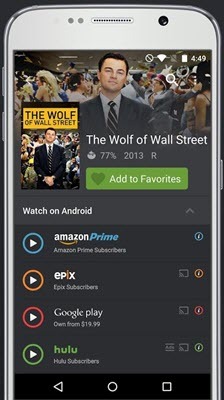 Yidio movie search app also supports Chromecast and is available for Android, iPhone and iPad. Hubi is a useful free movie app that lets you stream and download your favorite videos from the popular online streaming services or video hosters. You can watch your favorite videos, movies and TV shows online and can also download it your mobile phone or tablet for offline viewing. You don’t need Adobe Flash to watch videos on Hubi. Currently Hubi supports the following video services: 180Upload, AllMyVideos, BillionUploads, DaClips, DivXStage, DwnSo, EcoStream, FileBox, FileNuke, GorillaVid, MovPod, MovReel, MovShare, MuchShare, NosVideo, NovaMov, NowVideo, PutLocker, ShareSix, ShareRepo, SockShare, SockShare, StageVu, StreamCloud, UploadC, UploadHero, VeeHD, VidBull, VidHog, VideoBeer, VideoSlasher, VideoWeed, VidxDen, Vk, Vodu, VReer, YouTube (streaming only), Zalaa, Zinwa. You can use your player including MX Player, VPlayer, MoboPlayer to play or stream your video content using Hubi. The history features allows you to track the videos you have watched and you can also save the selected ones as favorites. Hubi is free to download, use and is available for Android and iOS devices. This app is completely legal to use as it does not host any movie or video content. 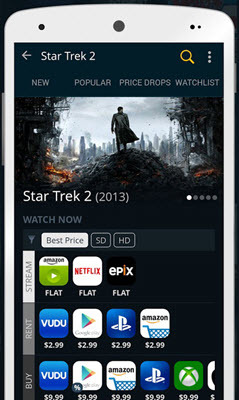 Hotstar is one of the most popular and downloaded free movie apps in India. On Hotstar you can watch movies, TV serials an cricket for free. You can watch both Bollywood & Hollywood movies as well as Hindi and English TV shows. Hotstar app is very well optimized and it consumes 50% less data on your mobile connection. You may also subscribe to hotstar premium to access all the exclusive premium movies and TV shows. Hotstar movie app is available for Android and iOS devices. Well I have tried my best to list down the best free movie apps for mobile phones and tablets for different platforms that include Android, iOS and Windows Phone. These movie apps are completely free to use and you can watch free movies and TV shows on them. Some of these movie apps allow you to search your favorite movies or TV shows on various popular and legal online movie streaming sites. If you want to suggest any other good free movie app then you can tip us by leaving a comment below. never had bsnl sim so can’t advise on this. You can search on google for manual bsnl gprs settings.